After the CONCACAF championship went to a Mexican club for a 10th straight year with Club America's come-from-behind triumph over the Montreal Impact in the CCL final second leg, Liga MX took the opportunity to take a little social media shot at MLS. Given that no MLS team has ever won the CCL in its current format and Mexican teams have won each of the seven editions since the changeover to group stage/knockout stage, Liga MX teams have grown accustomed to taking part in the FIFA Club World Cup. The Mexican top flight made sure to remind MLS of that fact immediately after America's 4-2 (5-3 on aggregate) win at Stade Olympique. La @MLS tendrá vacaciones en Diciembre... Otra vez. Translated: MLS is headed for another December vacation, while we're headed for the Club World Cup. Given that the U.S. men's national team just topped Mexico by a Dos-A-Cero scoreline and the two could be on a collision course in this summer's CONCACAF Gold Cup, the rivalry between the two nations and their respective top-flight leagues is alive and well. USA and Mexico players watch Rafa Marquez's 89th-minute header find the net in a famous World Cup qualifying win in Columbus for El Tri. 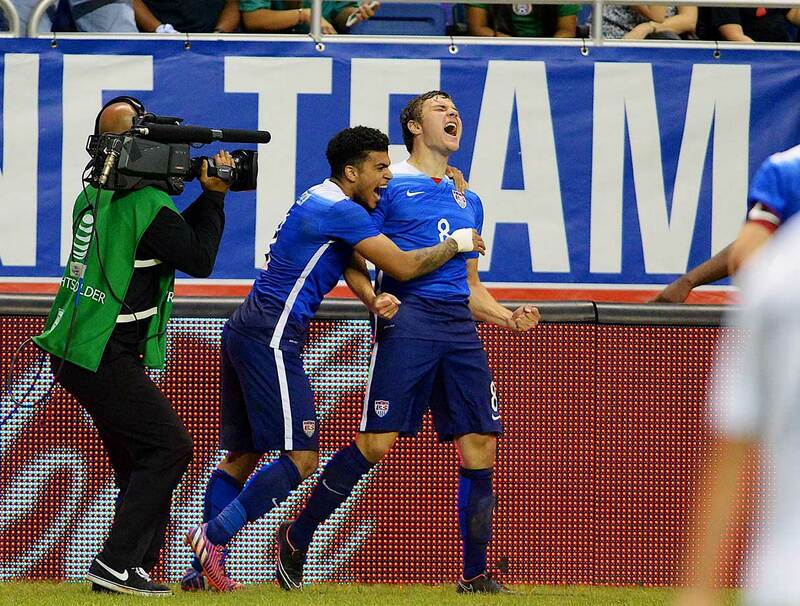 Stanford University's Jordan Morris marked his first senior national team start with his first international goal, sparking the USA in another 2-0 triumph over Mexico, this one at the Alamodome in San Antonio. 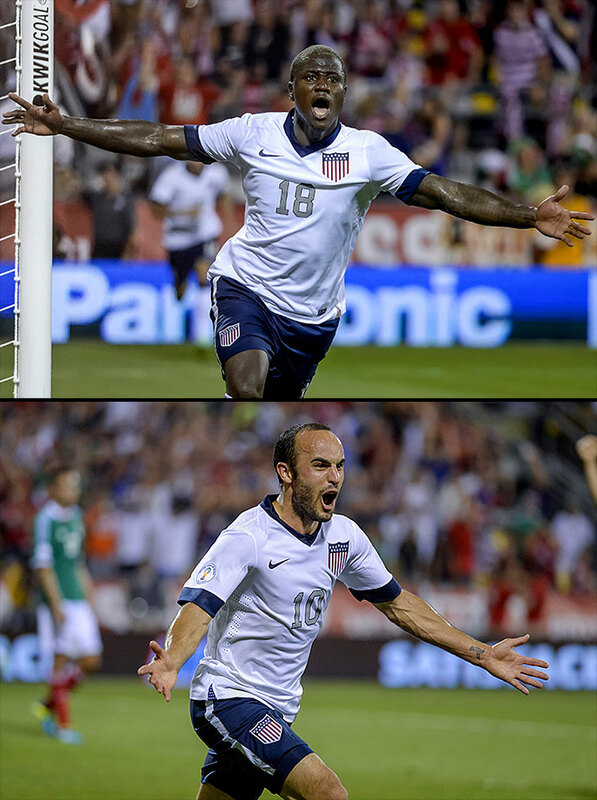 Eddie Johnson and Landon Donovan scored second-half goals to beat El Tri by the same score for the fourth consecutive qualifier in Columbus, Ohio. Clint Dempsey captained the U.S. to a 0-0 draw at Estadio Azteca, the second time ever the Americans registered a point in World Cup qualifying in Mexico (the other a 1997 tie). 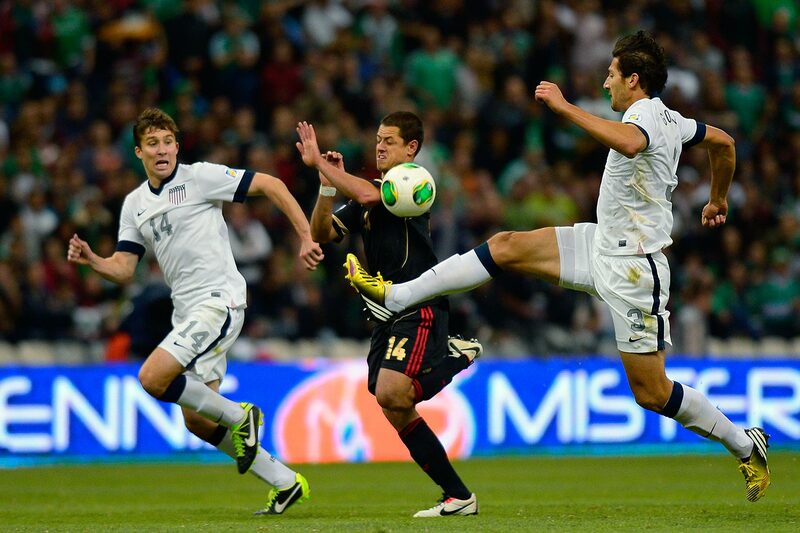 Defenders Omar Gonzalez and Matt Besler were the stars as Mexico couldn't cash in on several opportunities. The U.S. escaped to remain in second place in CONCACAF qualifying. It took 25 attempts, but after this friendly, the United States could finally say that it had won at Mexico City's Azteca Stadium. Despite being outplayed for most of the match, the U.S. won thanks to an 80th-minute goal from Michael Orozco Fiscal — the first international goal of his career. 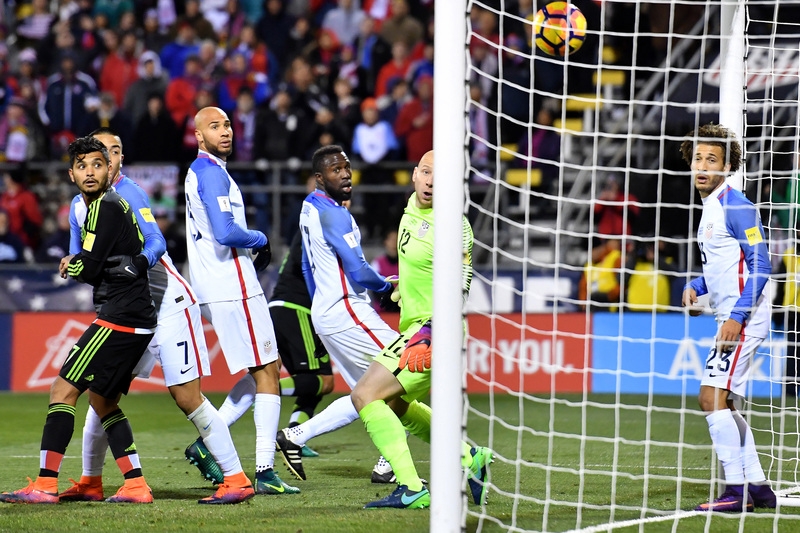 Head coach Jurgen Klinsmann's U.S. debut got off to a rough start, as the Americans trailed Mexico, 1-0 after an uninspired first half in Philadelphia. The U.S. showed more verve after halftime, though, and an impressive display from Brek Shea and a 73rd-minute goal from Robbie Rogers led to a 1-1 draw. In the Gold Cup final, Mexico captured its second straight title in the battle for CONCACAF bragging rights and secured a berth in the 2013 Confederations Cup. Pablo Barrera scored twice; Giovani Dos Santos and Andres Guardado also had goals. The U.S. was up 2-0 early on Michael Bradley and Landon Donovan goals, but poor defending (partially due to the loss of Steve Cherundolo by injury) doomed the Americans. The U.S. took its first-ever lead at Azteca Stadium, but went on to lose 2-1 in what was a critical World Cup qualifier for Mexico. The win changed the tide for the then-struggling Mexican squad, as it went on to go 3-0-1 in its next four matches to earn a trip to South Africa. The U.S. still went on to finish first in CONCACAF qualification. 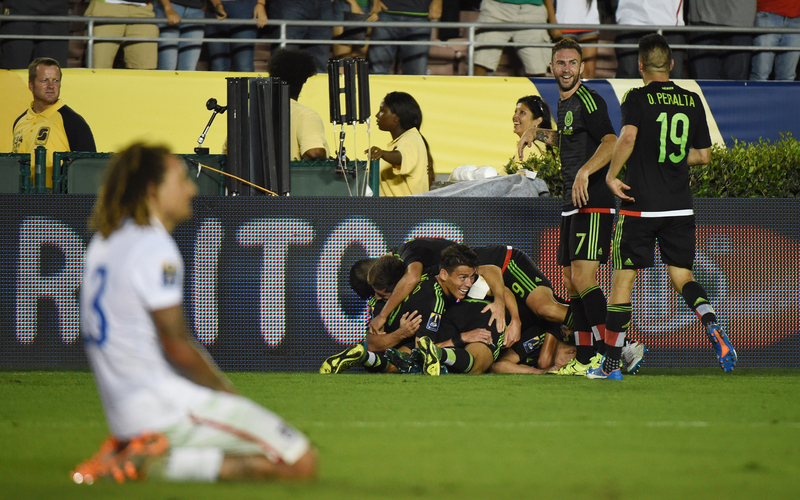 Mexico put an emphatic end to the Americans' 9-0-2 home streak against "El Tri." 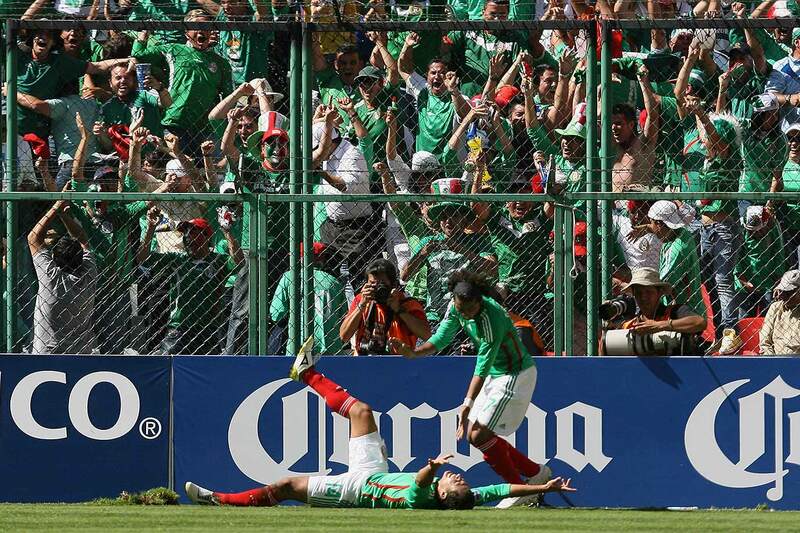 The Mexicans took the Gold Cup from the two-time defending champion, with five different players scoring goals in the second half at Giants Stadium. Two goals from Michael Bradley gave the U.S. another home victory over Mexico. 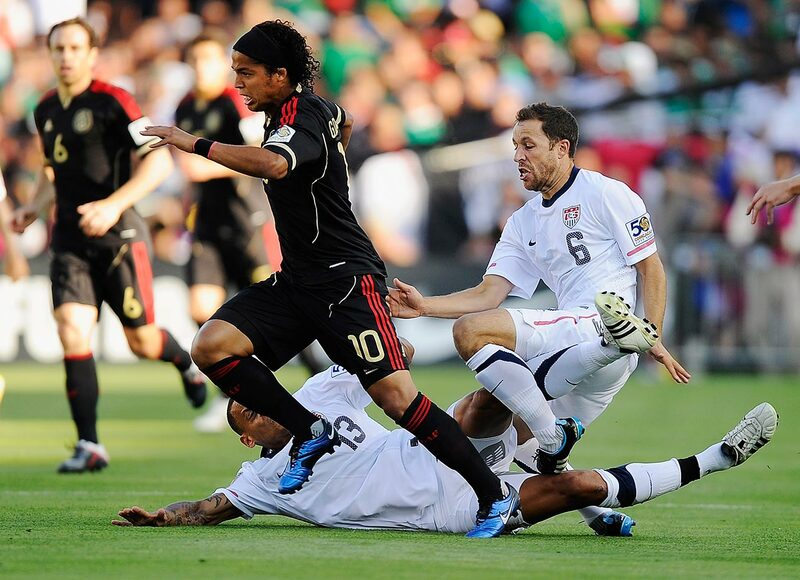 It marked the eleventh consecutive time that the Americans had gone unbeaten against Mexico when playing on U.S. soil. 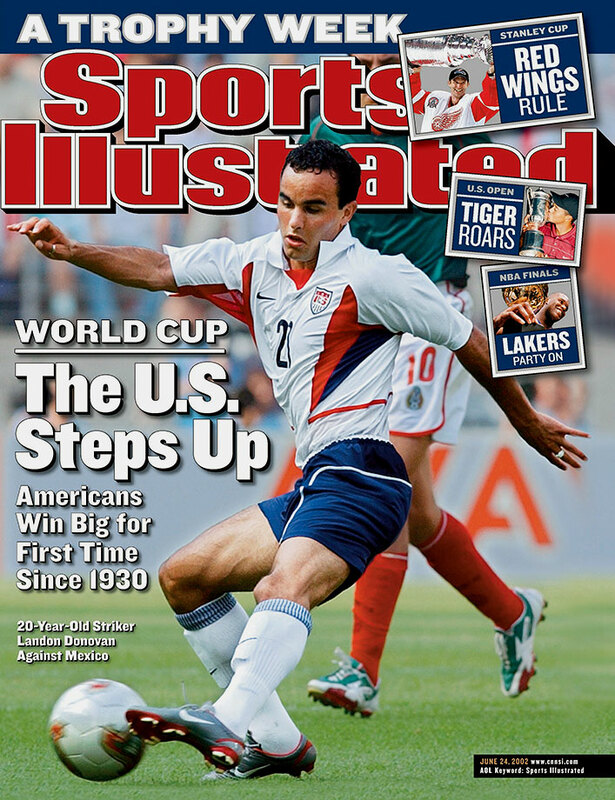 Down 1-0, second-half goals from Landon Donovan and Benny Feilhaber gave the U.S. the victory in the 2007 Gold Cup finals. 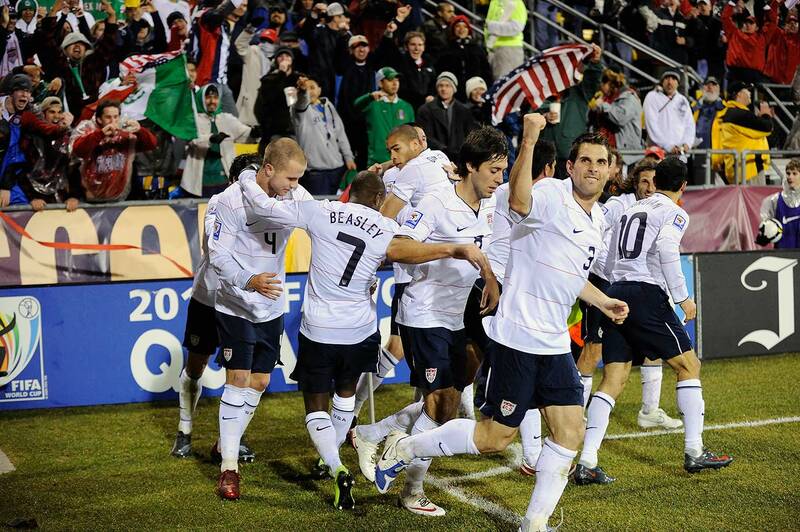 The win earned the Americans a spot in the 2009 Confederations Cup, where they achieved their famous upset over Spain. 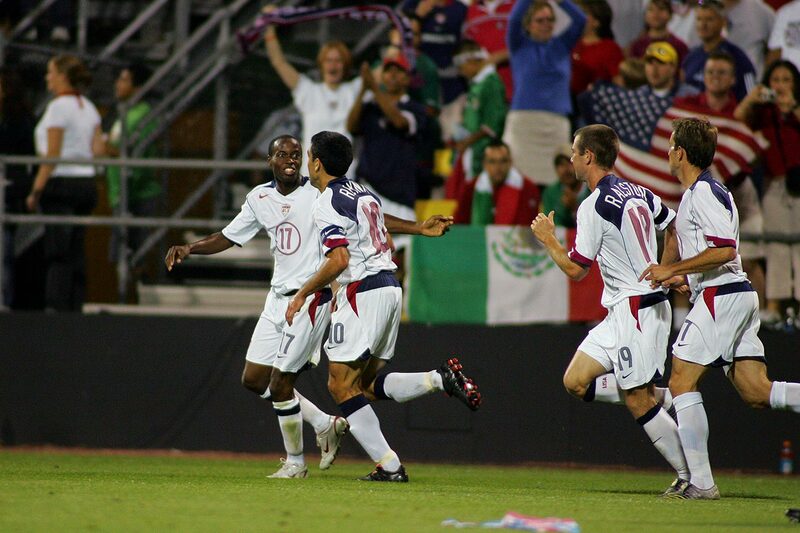 A 2-0 victory over "El Tri" clinched a spot in the 2006 World Cup, with goals coming from Steve Ralston and DaMarcus Beasley. In their first meeting since the 2002 World Cup, an all-MLS squad of Americans played Mexico to a 0-0 draw in front of more than 69,000 people in Houston. Arguably the biggest win in U.S. soccer team history came against its archrivals at the 2002 World Cup. Brian McBride and Landon Donovan gave the Americans a 2-0 victory in South Korea to send their team to the quarterfinals. It is the furthest stage the team has reached in the World Cup since 1930. 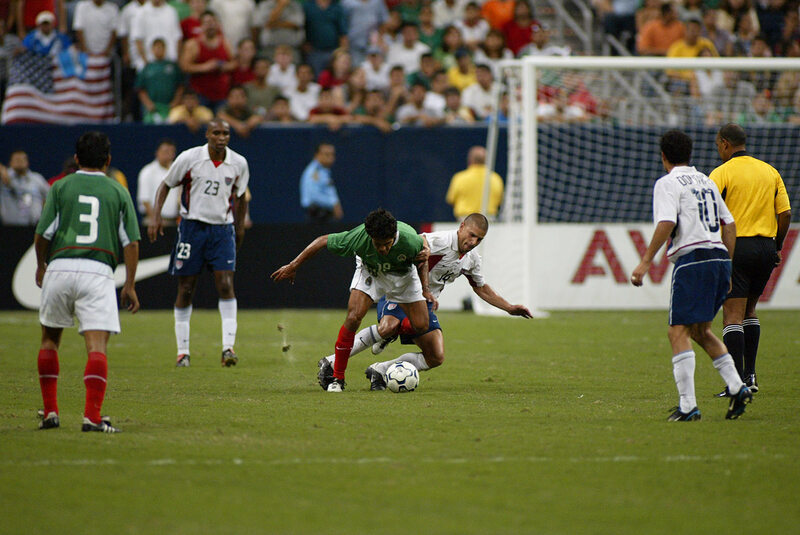 Needing a win to stay in contention for the 2002 World Cup, the Mexicans won 1-0 at Azteca Stadium, making their record 21-0-1 when hosting the Americans. 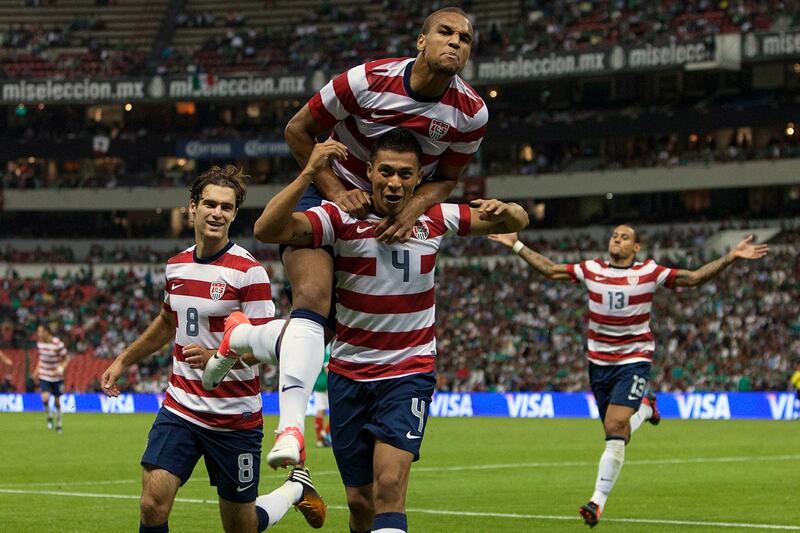 For the first time ever, the Americans won their third consecutive game against Mexico. The victory came in the World Cup qualifying finals and was held in Columbus, Ohio. 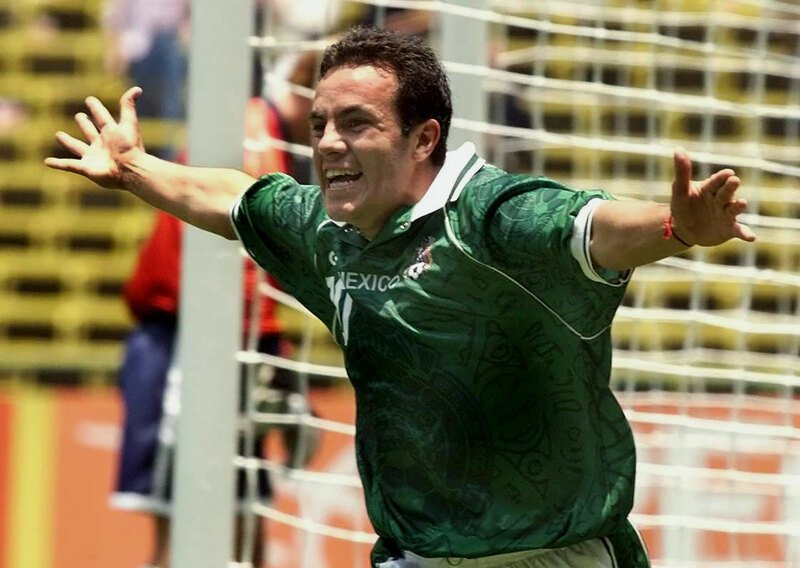 Cuauhtemoc Blanco's goal in extra time eliminated the U.S. in the semifinals of the 1999 Mexico City Confederations Cup. The win capped off a long tradition of Mexican dominance over the American side, a streak that shortly thereafter ended, as the Americans won the next three matches against their rivals. The USA outlasted Mexico in a penalty shootout to reach the semifinals of the 1995 Copa America. 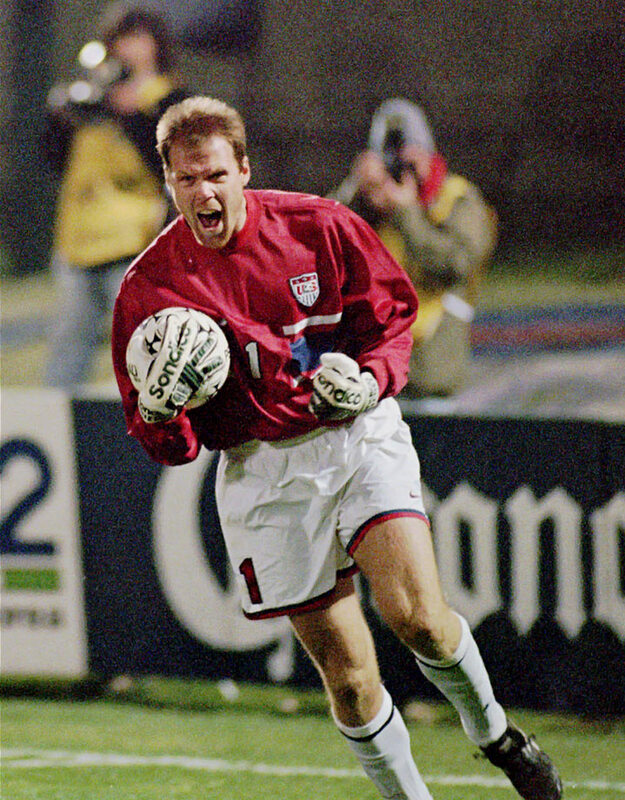 After a 0-0 draw, goalkeeper Brad Friedel was the hero in PKs, making two saves. The U.S. made all four of its attempts and advanced.